This post is sponsored by Albertsons Safeway. All opinions, adorable kids, and lovable furry family members are my own. We love Halloween around here! And, of course my babies pretty much practice dressing up every other day of the year too! 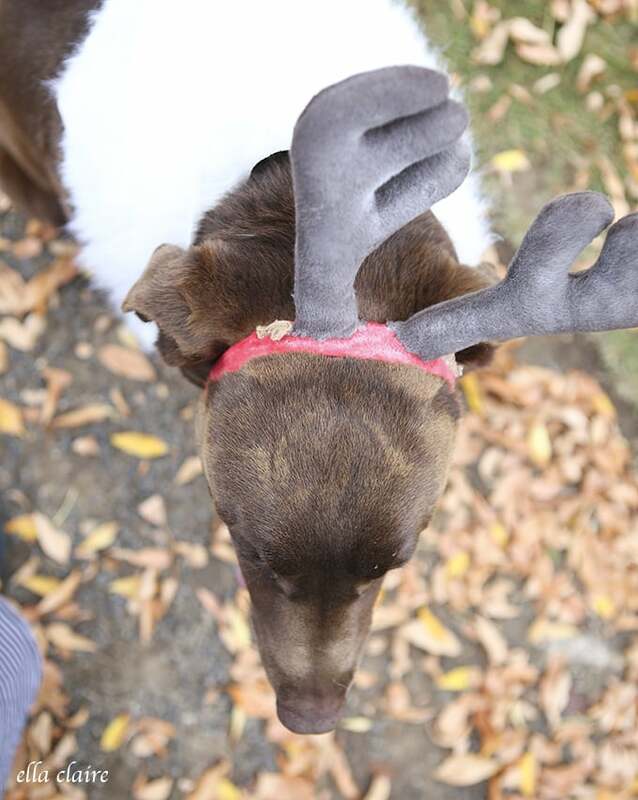 This year we thought our sweet pup could join in on the fun. 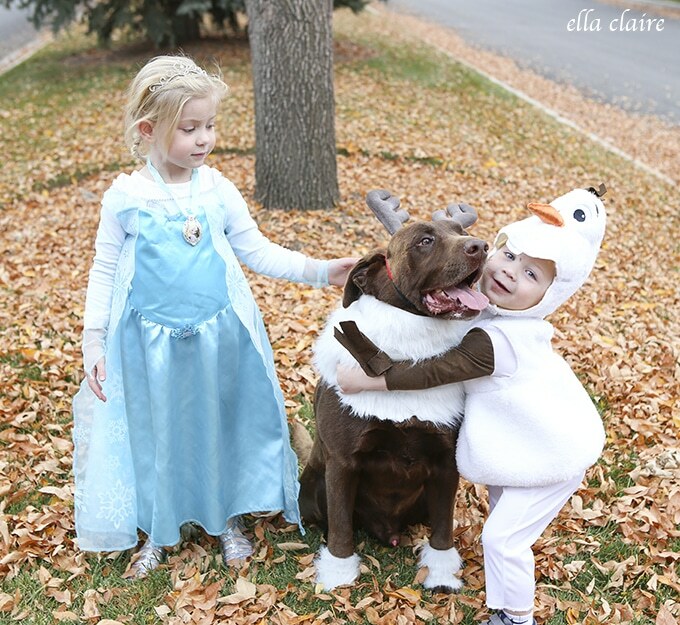 I say pup, but he is really a 90 pound, 8 year old lab, and for our girl who loves Frozen, he makes the perfect sized Sven! I whipped up this costume for him and the kids thought it was the funniest thing in the world. 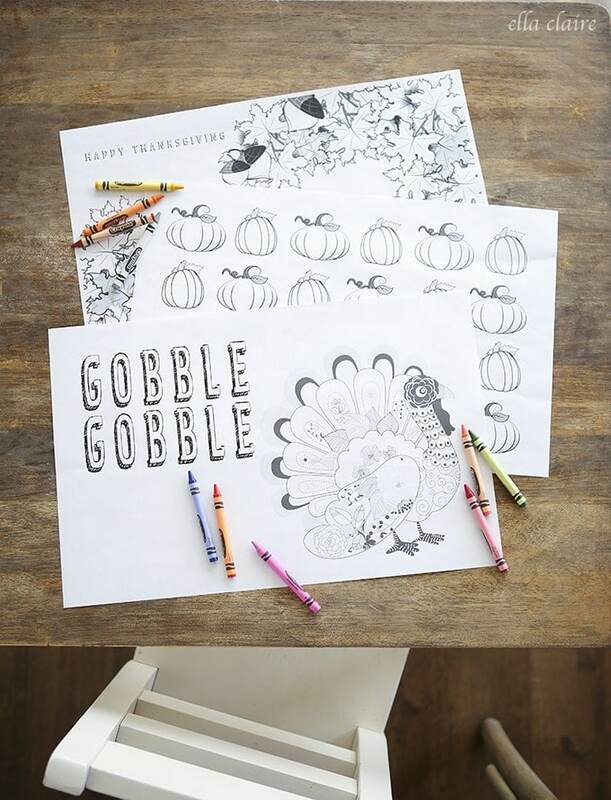 I thought I would share how to DIY this project with you today as well as an opportunity for you to win free dog food and money for your local animal shelter by sharing a picture of your dog in their halloween costume! He might be a big boy, but he is so gentle and loving with my babies and they adore him. If you are thinking about DIYing this Sven costume too, I think you will be pleasantly surprised at just how quick and easy it is to make! 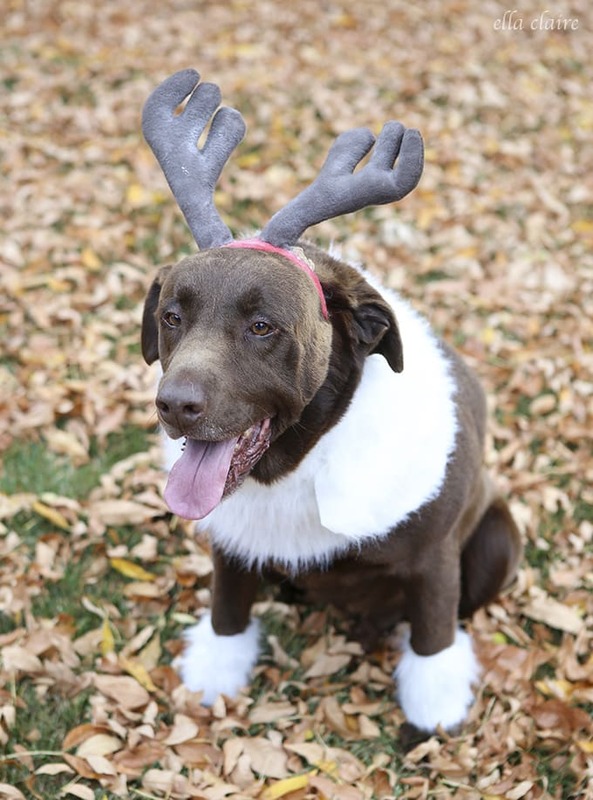 We ordered these antlers from Amazon (affiliate link) in the Large size (note- it looks like the may have sold out of the Large size on this link, but hopefully they will restock soon. You may need to do a search on Amazon). It has a little adjustable chin strap that fit his head perfectly. The antlers were a little bit too dark to be Sven’s so I brushed all sides of them with white chalk to lighten them. They could also be painted. I also cut the little ears off. 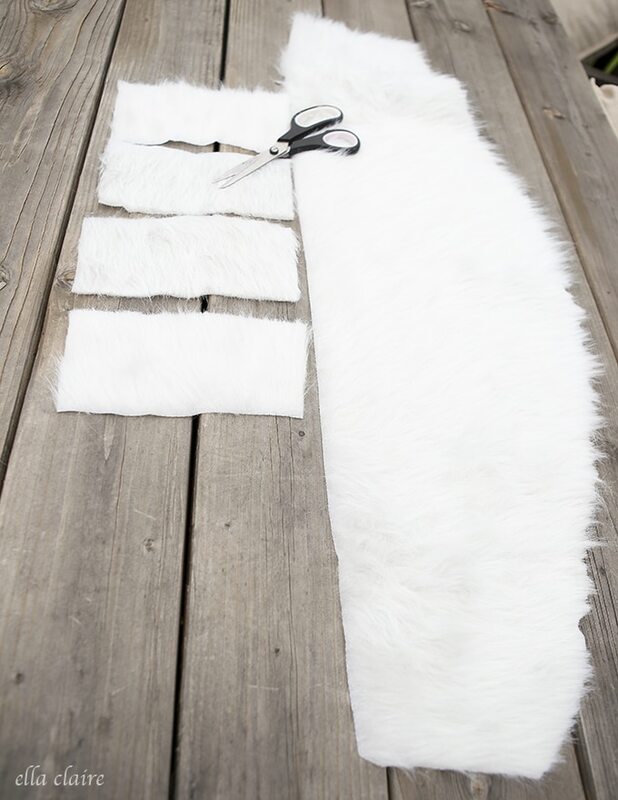 To create the fluffy white fur like Sven’s collar and ankles, I just headed to the fabric store and grabbed a half of a yard of the white faux fur. I cut 2 strips of the fabric about 5 inches tall with enough width to go around his leg with a little to overlap. I used heavy duty safety pins to attach the sides to each other, pinning from the inside out so he wouldn’t accidentally get stuck. If you want to take the time to sew in velcro, that would also work very well too. Note- the picture below shows 4 of them, but I only ended up doing them on his 2 front legs. His back leg joints were too wonky. I cut the collar the length of the circumference of his neck with a little overlap, and had this sort of bell shape (that you can see below) to add that fluffiness to the front of his neck. This doesn’t have to be perfect at all, so I just eyeballed it. You will have to make adjustments depending on your dog’s size etc. I used safety pins to attach both sides of this as well, but again, velcro would be great here too. Nestle Purina and Albertsons Safeway stores are hosting the Hairy ‘n’ Scary contest this month! 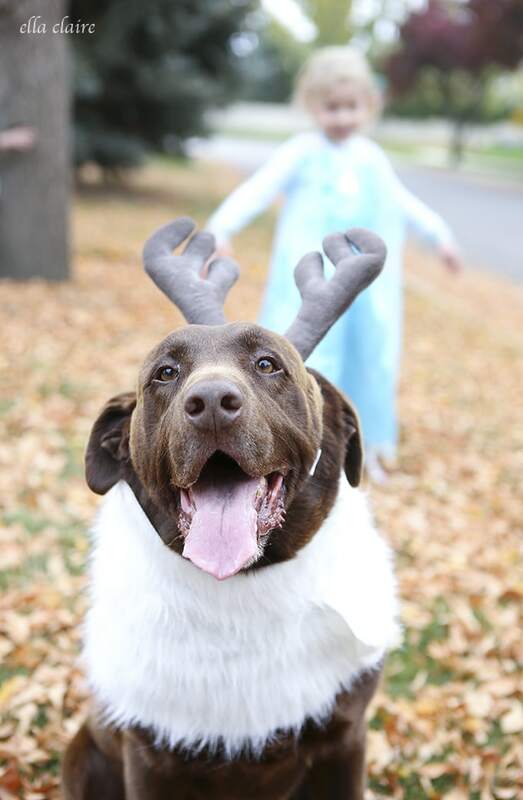 Take a picture of your pet dressed in their Halloween costume and share it on facebook or twitter, using the hashtag #HairyNScary AND be sure to tag your local Albertsons Safeway owned grocery store! Thats it! Your photo will appear on your local Fan Reel page. One winner will be selected to receive a $250 donation along with ten (10) bags of Purina ONE® (16.5lb.) and ten (10) bags of Purina® Cat Chow® (16 lb. ), in their name, to their local, non-profit, accredited animal shelter or rescue to assist with housing, feeding, caring for, and finding families for, thousands of dogs, cats and other lovable creatures. I can’t wait to see all of your adorable entries! We love Albertsons and we love Purina dog food, so we are excited to participate in this fun contest! hey girl this is so cute! Love the pics! 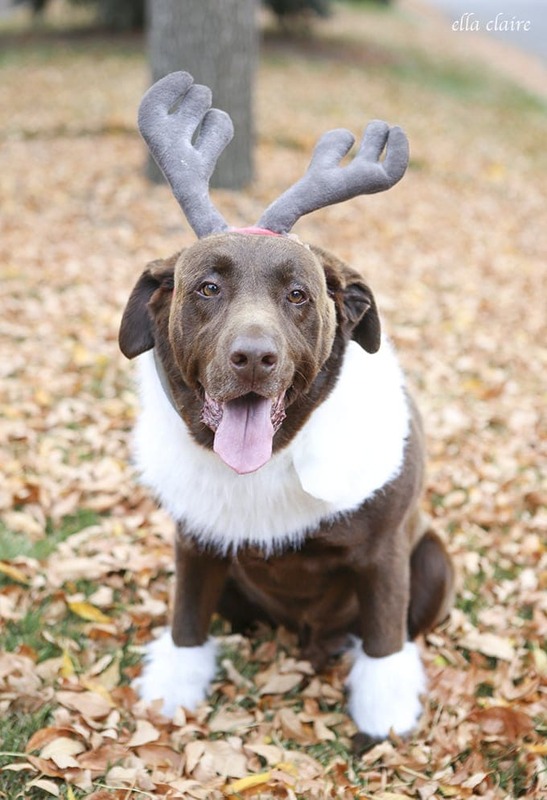 My parents have a chocolate lab to, this looks just like him!